The vacation-rental business is not a new one, but in recent years a slew of companies have risen up to modernize it. One of the market leaders, HomeAway, offers more than 325,000 rentals around the world and went public in 2011. Travelers can also turn to peer-to-peer services such as Airbnb, which allows members to rent out their homes for short periods. Airbnb has raised $120 million in funding since 2009, according to published reports. Priceline's Booking.com also recently entered the market by including vacation rentals with hotels in its lodging results. Priceline bought travel meta search engine Kayak, on whose board HomeAway CEO Brian Sharples sits, for $1.8 billion last November. Because the market is so crowded, and because Luxury Retreats is not yet, admits Kern, "the Starbucks of the space," the company woos clients by focusing intensely on service and amenities. Take Kirk Muller, coach of the National Hockey League's Carolina Hurricanes. He spent nine days with family in a rented villa on Italy's Amalfi Coast in June. A Luxury Retreats staffer suggested a cliff-top villa in Praiano, a small fishing village. Breakfast was prepared by a private chef and each morning the concierge catered to their every whim. The Italian man assisting Muller's family arranged a private day trip to Corsica aboard a 30-foot yacht. It was Muller's fifth time using Luxury Retreats. He says he was drawn by the personal service and what it means: "the value of your own privacy, the fact that you have it pre-planned ahead of time but with the flexibility of changing your plan." Luxury Retreats's commission on rental fees is between 20 and 30 percent -- the industry standard, and similar to that of competitor Villas of Distinction. 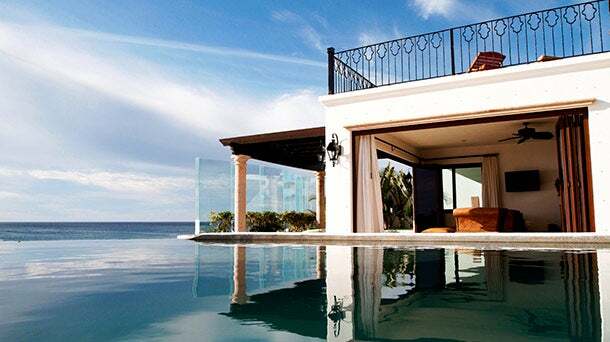 Casa La Laguna, Doug Schneider's 13,000-square-foot villa in Cabo San Lucas, Mexico. Doug Schneider started renting his villa in Cabo San Lucas, Mexico, in 2008 after a $2.8 million expansion. He lists his property with more than 12 rental companies, although Luxury Retreats customers accounted for about 55 percent of his villa bookings over the past two years. Schneider's 13,000-square-foot compound, whose multi-tiered swimming pools are connected by a water slide, regularly attracts celebrities and other VIPs, what Poulin calls his "AAAA clients." What bubbles up most in conversations with Poulin is his possessive pride; he has been fielding buyout offers for years. In 2005, the nonprofit motor club AAA expressed interested in buying his company. "We're not for sale," he told them. When AAA offered instead to take a 20 percent stake, valuing the company at about USD$20 million, Poulin accepted. A year ago, however, he and Kern bought back AAA's interest in Luxury Retreats, wanting greater ownership. Still, Poulin says being based in Montreal puts Luxury Retreats at a disadvantage when competing for attention in the States. He decided that securing venture capital would help raise the company's profile and represent the vote of confidence he longed for. As of September, when Luxury Retreats received its first infusion of venture capital, Montreal-based iNovia Capital estimated the total market value of the properties in the Luxury Retreats portfolio at more than USD$6 billion. The initial funding offer, led by iNovia, was USD$20 million, but Poulin talked the investors down to USD$5 million in exchange for a smaller, undisclosed stake in the company. "I'm not looking to exit," he says. "I look at what I've done on my own, and I say, if I bring a lot of smart people around me, if I bring really good investors, a really good management team, I can only imagine what they're going to help me do." Poulin has several goals for the next two to five months. Among other hires, he wants to bring in a vice president of marketing as new destinations open up, including London and New York. And his role will continue to shift. After bootstrapping for so long, he wonders, "How do I become more the general of the army?" But then Poulin, who has dedicated half of his life to his company, of which he still owns between 70 and 80 percent, backpedals: "I'm an operator, so I like to be right into the details of things, and I'll never let go of that." Corrections & Amplifications: An earlier version of this story misstated AAA's 2005 investment in Luxury Retreats. The nonprofit motor club purchased a 20 percent stake in Luxury Retreats at a valuation of about $20 million.